Jiminy Cricket: [after singing "When You Wish Upon a Star"] Pretty, huh? I'll bet a lot of you folks don't believe that, about a wish comin' true, do ya? Well, I didn't, either. Of course, I'm just a cricket singing my way from hearth to hearth, but let me tell you what made me change my mind. Q: Why was the coachmen turning young boys into donkeys? 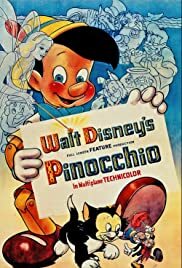 Darker in tone than most Disney animated features (except for 'Hunchback of Notre Dame'), 'Pinocchio' came shortly after 'Snow White' and showed marked improvement in the art of animation technology to produce startling special effects. The first twenty-five minutes alone raise the film to the level of true animation art. Gepetto's inventive clocks come to life as realistically as any real-life photography could do. The warmth and cosiness of his dwelling and the charming shenanigans of Figaro the kitten and Cleo the goldfish, are all perfectly realized. The imaginative use of music and animation art is never finer than in these opening scenes. Afterwards, as the plot thickens, the special effects are just as impressive. The scene of Gepetto searching for Pinocchio with a lantern on a rainy night after he has been captured by Stromboli is unforgettable imagery. The wagon lurching along roads with Pinocchio in a cage is a frightening thing. Even darker are the adventures that await Pinocchio when he reaches Pleasure Island. The scene of the boys turning into donkeys is probably one of the most awesome and frightening moments in the film. Altogether charming are the underwater sequences before the meeting of Monstro the Whale. The climactic chase after the escape from the belly of the whale is handled brilliantly. The music perfectly accents the dramatic chase for this sequence and the songs throughout are in keeping with the mood and characters of the story. It is the sharp contrast between the lighter moments and the darker ones that gives the film a correct blend of fantasy and horror. Parents should be cautioned that very young children may be frightened. Has to be considered one of the most beautifully animated Disney features of all time. A treasure to see again and again.